Azir [Tier 1 Mid] - An all-time favorite for professional players, Azir is currently touted as one of the most oppressive mid-laners on the rift. As a result, players are enjoying his lane bullying dominance to the utmost. When you couple this with his potentially game-changing ultimate, it's no wonder he's a champion that fits into most player's arsenals. Ezreal [God Tier Marksman] - Ezreal continues to deal far too much damage for a champion that's chosen to go down the greedy tree (Inspiration). Because of this, he simply has a ton of advantages over every other marksman at this point and there are few reasons to not pick him if he's open. Jhin [Tier 1 Marksman] - The rise of Jhin seems largely a result of poke supports being so popular on the rift now. He synergizes extremely well as a high-poke champion himself, and actually works very well with somewhat off-meta supports like Xerath. Miss Fortune [God Tier Marksman] - Similar to Jhin, Miss Fortune really excels at early game poke damage and bullying power. Most games also snowball quite quickly, and as an early to mid-game champion, this works in her favor. Morgana [Tier 1 Jungle] - Some of you might be thinking oh goodness...SSJ's gone off the deep end...again. However, the new patch changes have resulted in a massively healing Morgana via her W changes. As a result, she can sustain extremely well in jungle. When you combine this with her obnoxiously long crowd-control, she works quite well as a jungler. 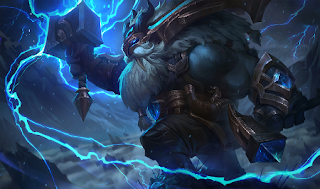 Ornn [God Tier Top] - Ornn's top lane prowess is mostly invested in his unkillable nature and massive crowd-control. His built-in shield and CC-prevention makes him extremely difficult to deal with, and now that players aren't rushing death cap first item, he's quite difficult to beat. Xerath [Tier 1 Support] - As one of the strongest poke champions in the game, Xerath's viability as a support skyrocketed with the release of the Manaflow Band rune. More on Xerath support here. Xin Zhao [Tier 1 Jungle] - Xin's one of those champions I always thought was incredibly strong, but the cat's finally out of the bag and everyone else is waking up to it as well. His ability to snowball games is immense, and he's far too tanky for a champion that builds mostly damage items. Zoe [God Tier Mid] - Zoe's power lies in her immense flexibility, and although she takes quite some time to master, it's well worth it for the insane amount of play-making ability she has at her disposal.